JSC RZD Logistics and the Belarusian Railway agreed to work together on the development of transit services on the route China–Europe–China. The agreement was signed by the parties in the framework of China (Shenzhen) International Logistics and Transportation Fair (CILF) in Shenzhen (China). The document was signed by CEO of RZD Logistics Viacheslav Valentik and the First Deputy Head of the Belarusian Railway Igor Shylov. 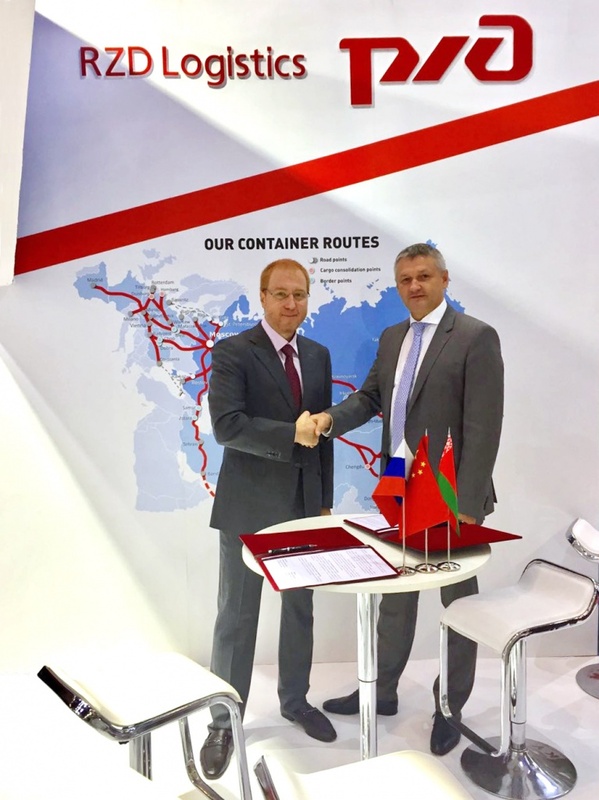 The parties agreed to develop transit container shipments across border points Brest–Terespol, Svisloch–Semyanuvka and Bruzgi – Kuznica Belostockaya with the participation of a state company Belintertrans-Transport and Logistics Center of the Belarusian Railway (BTLC). RZD Logistics and the Belarusian Railway will also work together on the service of accelerated delivery of LCL cargo in baggage train cars – Rail Jet – and will organize such regular shipments on the route Beijing – Moscow – Minsk with the delivery in 8 days. Another important project implies using TCU Kolyadichi as a distribution center for goods from China, which are delivered to Europe. In this and other projects the companies agreed to jointly use the park of train cars for shipments’ organization. “Today we see that China is very interested in reducing the time of delivery, including the delivery of e-commerce goods, and is also interested in appearance of modern distribution centers in areas of entering points to Europe. These centers should be capable to consolidate large volumes of cargo and distribute smaller volumes across the territory of Europe”, — commented CEO of RZD Logistics Viacheslav Valentik during the ceremony.